Rebuilding time for the GOP… But there are no easy fixes… GOPers softening their opposition to tax hikes on the wealthy?... Obama meets with congressional leaders to discuss the fiscal cliff at 10:15 am ET… Petraeus testifies (behind closed doors) on Capitol Hill… Pew gets voters’ grades on the 2012 election… And Autopsy 2012: examining the evangelical vote. *** Rebuilding time: As National Journal’s Ron Brownstein writes, the Republican Party now finds itself in the same position that Democrats were in after 1988: searching for a way to broaden the party’s appeal and message. (Or as former Mississippi Gov. Haley Barbour puts it, the GOP is in need of “a very serious proctology exam.”) Back in 1988, a former Massachusetts governor had just lost -- decisively -- to a vulnerable opponent, marking the fifth time in the last six presidential elections that Democrats had lost the popular vote. Flash forward to now: Another former Massachusetts governor has just lost -- decisively -- to a vulnerable opponent, marking the fifth time in the last six presidential elections that Republicans have lost the popular vote. Brownstein notes that Democrats, after the ’88 election, looked inward, created the centrist New Democrat movement, and turned to Bill Clinton to rebuild the party’s image. And the question for the GOP becomes: What does it do to turn around its presidential fortunes come 2016? Or, as the Wall Street Journal reports of a growing narrative among Republicans, was the loss simply Romney’s fault? *** But no easy fixes: On Wednesday, RNC Chairman Reince Priebus delivered a presentation of exit poll data to GOP senators that pointed to several reasons why Republicans lost. (And by the way, none of those reasons mentioned the word “gifts.”) They included changing demographics (the white share of the electorate has declined from 81% in 2000 to 72% in 2012); George W. Bush (who was blamed more for the current state of the economy than President Obama); and a failure to be perceived as the champion of the middle class (44% of voters believed Obama’s policies favored the middle class, versus 34% who said the same about Mitt Romney’s policies). The problem for the GOP is that there are no easy fixes to those challenges. Republicans could sign on to comprehensive immigration reform as a way to better appeal to Latino voters, but which party would get credit for that legislative achievement -- the GOP or Democrats? In addition, this election proved that it’s difficult for the Republican nominee to break away from the Bush brand, even as Romney kept his distance from the former president. And as the debate over the fiscal cliff negotiations is proving, it’s hard for the GOP to be perceived as the middle class’ champion when it’s fighting against taxes being raised on the Top 2%. 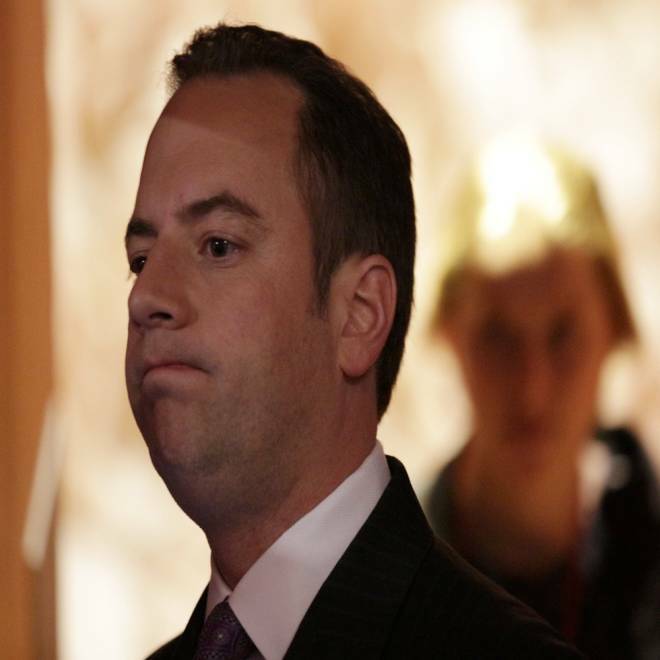 Republican National Committee Chairman Reince Priebus waits for the start of the U.S. vice presidential debate between Republican vice presidential nominee Paul Ryan and U.S. Vice President Joe Biden in Danville, Kentucky, October 11, 2012. *** GOPers softening their opposition to tax hikes on the wealthy? But as Politico reports, some prominent Republican governors (both past and present) are softening their opposition to increased taxes on the wealthy -- as long as they get something in return for it. “The people have spoken, I think we’re going to have to be [flexible] now,” Virginia Gov. Bob McDonnell said at the Republican Governors Association meeting in Las Vegas. “Elections do have consequences. The president campaigned on that [raising taxes on the wealthy].” Added former Mississippi Gov. Haley Barbour: “If there’s enough savings, if there’s enough entitlement reform, if there’s enough certainty about tax reform in the next few years, I would [consider letting the Bush tax cuts expire for the wealthy].” And these statements come before Obama’s meeting, at 10:15 am ET at the White House, with bipartisan congressional leaders to discuss the fiscal cliff crisis. *** Grading the 2012 election: According to a new Pew poll, the public gives the 2012 presidential election some low marks. Just 38% said there was more than usual discussion of the issues, which is down from 57% who said this after the 2008 election. In addition, more than two-thirds said there was more than your usual mudslinging, up from about half who said this four years ago. Meanwhile, voters gave Obama a C+ for the performance of his campaign (down from B+ in ’08); they gave Romney a C (down from McCain’s C+); they gave the press a C- (down from C); they have the pollsters a C+ (down from B-); and they gave the voters a C+ (down from B). Also, the Pew poll noted that 92% of voters followed the Election Night returns on TV, 34% followed them on the internet, and 27% were “dual screeners” -- meaning they both watched TV and surfed the internet. *** Autopsy 2012: Examining the evangelical vote: Nationally, Romney won a larger share of the white-evangelical/born-again vote in last week’s presidential election than John McCain four years ago, despite Romney’s Mormon faith and his performance with many of these voters in the ’08 and ’12 GOP primaries. But there was a drop in evangelical voters in the key swing states of Virginia, Wisconsin, and North Carolina. And in Ohio, although evangelicals increased as a share of the electorate by a point, Romney won a smaller share of them than McCain did in ‘08. In Virginia, in particular, the state appears to be becoming less evangelical. Even though Romney won the group by a wider share than McCain, evangelicals dropped by 5 points. Meanwhile, in Iowa and Colorado, turnout among evangelicals was up significantly -- 7 points in Iowa, 4 points in Colorado. And Romney held the margin from 2008 with the group. But it was not enough to offset Obama’s 22-point edge with non-evangelical voters in Iowa and Obama’s 42 (!!! )-point advantage with Hispanics in Colorado.